"MIAMI - For 2010 Taurus took the Judge Public Defender and made it even lighter with an incredible Ultra-Lite® aluminum frame. This new Public Defender weighs a mere 20.7 ounces, yet still delivers the same devastating firepower that makes its brothers famous. Nothing could be better for a nightstand gun or as a lightweight pack gun on trips thought the backcountry. Capable of chambering both .410 shotgun shells and .45 Colt ammunition, this amazing 5-shot combo gun is ideal for short distances - where most altercations occur - or longer distances with the .45 LC ammunition. The rifling has been finely tuned on this small frame revolver to spread the shot pattern at close quarters or to guide the bullet to the target. The Public Defender also features a reduced profile hammer that will not catch or snag for a quick and reliable draw. The Public Defender Ultra-Lite is available with carbon steel or stainless steel cylinder in either stainless or blued finish. All Taurus Judge models include fixed rear sights and fiber optic front sights as well as Taurus' ergonomic Ribber Grips®. Additionally, like all Taurus handguns, the unique Taurus Security System® allows users to securely lock the gun using an inconspicuous key-lock." I had been waiting for the Public Defender Ultra-Lite from Taurus for some time and was very pleased when mine arrived. Most of us know the history of the "Judge" series of revolvers. It has been perhaps the most well received line in recent memory. Anyone who has has been able to fire one also knows just how effective these guns are. Now with the Public Defender Ultra-Lite (PD Ultra-Lite), we have an easily carried revolver with the same capabilities as its larger brothers. I'd had .410 shotshells from Federal, Remington and Winchester for about 3 months, just waiting for this evaluation. All were developed specifically for the Judge. That says a lot about the popularity of this gun, that the "Big 3" would develop shells specifically for it. It was interesting to see the different approaches that each company took. All are 2.5" shells but that is where the similarity ends. 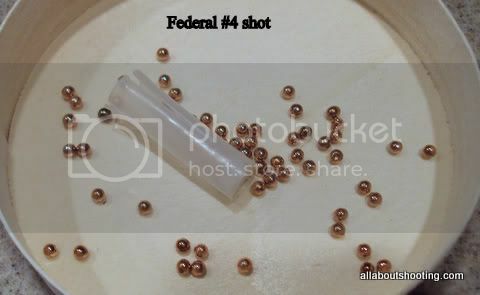 The Federal shells have 7/16 oz. 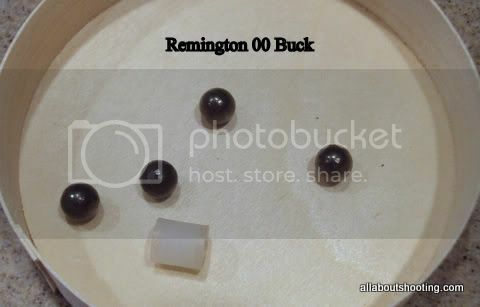 of #4 shot, the Remington shells have 4 pellets of 00 buckshot and the Winchester shells have 12 copper-plated BBs and 3 copper-plated cylinder projectiles. 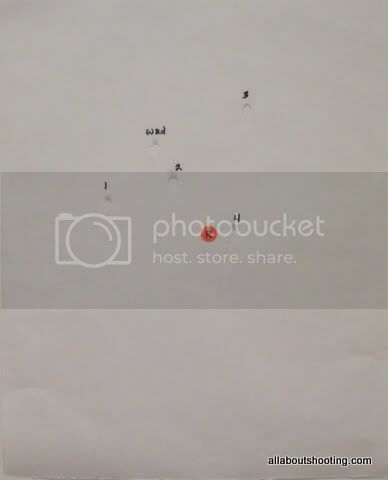 To establish some basis for comparison, I fired each of these loads several times through a 26" barreled .410 single shot shotgun, with the muzzle 7 yards from the target. I wanted to see how the patterns with that set-up would compare to the patterns at the same distance, from the 2.5" barreled PD Ultra-Lite. 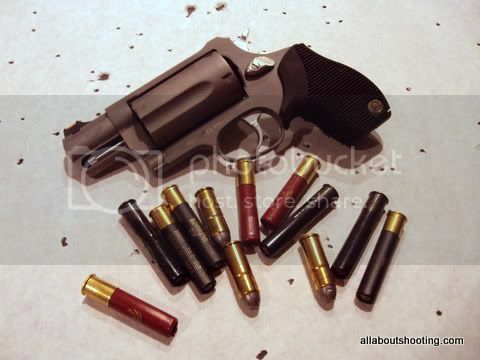 My gun is the "titanium finished version", just in the country, and is a very attractive revolver. The rubber grips are comfortable and the gun just feels good in my hand. I weighed it and it's exactly 20.7 oz. Over the last few weeks, I took the PD Ultra-Lite to the range and fired it with all of the .410 shotshells and with some .45 Colt cartridges and I've compared the results with the .410 shotshells with those that I had with the longer barreled shotgun. Take a look at the loads in the .410 shotshells. I fired all shots at the typical self-defense distance of 7 yards and at torso sized patterns, 18" wide by 21" long. I used "butcher paper" just as many manufacturers use to see the patterns at these close ranges. All targets were shot with a 2-hand hold but without any rest, pretty much like a shooter would hold a gun in a self-defense mode. 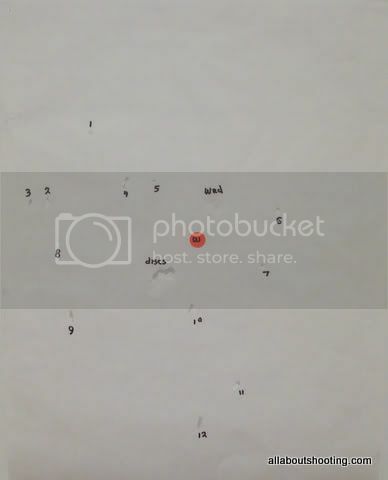 Below you can see typical targets with the various rounds. 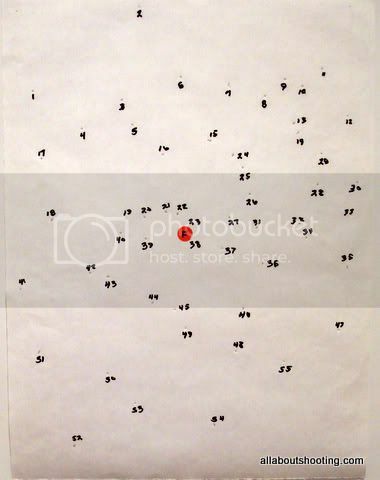 Please bear in mind that the targets you see are the result of one shot, with the exception of the .45 Colt round target. The PD Ultra-Lite holds 5 rounds, so quick multiple shots are easily accomplished. The resulting hits on targets with 2 or 3 shots are pretty dramatic but in the interest of clarity, I have not published any of those. You can imagine how they look, I'm sure. 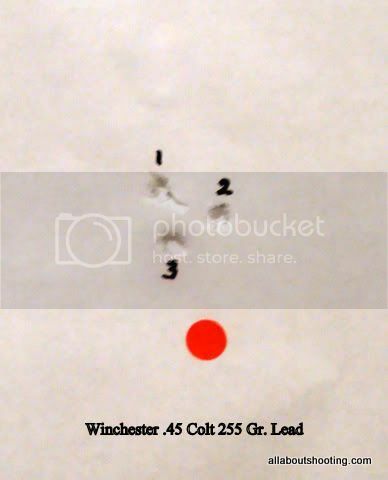 All of these shots were done quickly, with the PD Ultra-Lite first at my side, then raised to accomplish a 2-hand hold, acquire the target and then quickly fired. I tried as much as possible to emulate a self-defense situation. A few initial comments are in order. First of all while I have relatively large hands, the PD Ultra-Lite fit well with a 2-hand hold. The grip is shorter than the standard Taurus Judge but the rubber texture makes it very easy to hold and also reduces the felt recoil from this powerful handgun. All of the .410 shotshells produced what I consider to be excellent patterns. 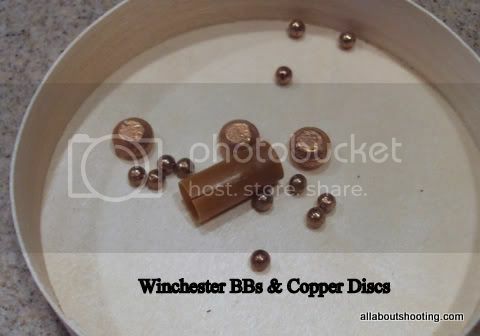 You will note however that on the Winchester pattern, only 2 of the 3 discs seem to have hit the target. It was essentially the same with every one of those shells that I shot, either from the PD Ultra-Lite or from the shotgun. I did see some differences in spacing of the discs but none more than 2" apart and most fairly centrally located toward the bottom of the pattern. It appears that disc #1 is followed closely by disc #2 in some instances. All 3 discs are hitting the paper but at times, it's difficult to see the imprint of all 3. While I have not included any pictures of the patterns these shells from the shotgun, they are remarkably similar. I'm not certain what I expected to see in the way of differences but they were so slight that if the targets were placed side by side, it would be difficult to identify which was fired from either gun. The published muzzle velocity of the Federal shell is 1200 f.p.s. and the Remington shell is 1300 f.p.s. Since the muzzle velocity of the Winchester shell was not on the boxes that I had, I spoke with the folks at Olin/Winchester and asked about that. I'm told that from the traditional 30" test barrel at 3' from the muzzle, it's about 1200 f.p.s. but when fired from a 2.5" barreled PD Ultra-Lite, it's 700 f.p.s. So, how does the Taurus Public Defender Ulta-Lite stack up as a personal self-defense gun? After living with this gun for almost 60 days and after several hours of range time, with a variety of .410 shotshell loads and some .45 Colt cartridges, I like this gun. I did not have any "fail to fire" situations. The trigger pull is crisp in single action and smooth in double action. The rubber grips allow a good hold, even with multiple shots and the recoil is very manageable. It's small enough that in states which allow CC, it could work well. I did notice that when I fired, let's say, 15 rounds of .410 through the PD, subsequent rounds became a bit more difficult to load. Since this gun is designed primarily for a self-defense and the average shooter is not likely to fire that many shells without cleaning it, I do not see that as any disadvantage. For me, it's a keeper! In the very near future I'll publish the results of my evaluation of a new "Carry Holster" designed specifically for the PD Ultra-Lite and also of my tests with some .410 slugs designed specifically for this gun.